Background: Unrelieved post-operative pain leads to physiological and psychological consequences which worsen outcomes. Patients still report a 31% incidence of severe pain and 47% incidence of moderate pain after surgery. Multimodal analgesia aims to improve satisfaction while reducing side effects. Opioids are the most common treatment for post-operative pain; however, acute tolerance and opioid-induced hyperalgesia increase opioid requirements and the risk of side effects. Previous studies with acetaminophen have shown consistent and clinically important opioid-sparing effects but were unable to demonstrate significant reductions in opioid-related adverse events (inadequate sample sizes, poorly monitored complications). Specifically, we propose to test the primary hypothesis that total duration of hypoxia (defined as saturation of peripheral oxygen (SpO 2 ) < 90%) is less in patients receiving intravenous acetaminophen than placebo. 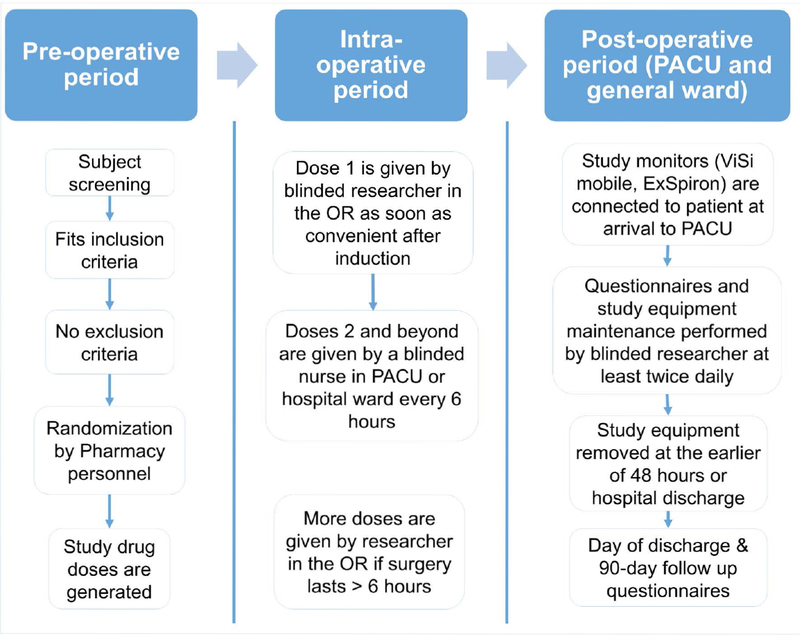 Methods/Design: A total of 528 patients undergoing elective open or laparoscopic abdominal surgery will be included in this prospective, randomized, double-blinded, placebo-controlled trial. Patients who have renal disease, liver disease, acetaminophen allergy, are on warfarin therapy, or are receiving regional blocks will be excluded. The incidence and duration of hypoxic events will be the primary outcome of the study. Secondary outcomes include opioid consumption, pain scores, post-operative nausea and vomiting, sedation, fatigue, respiratory rate, movement, and cost-benefit analysis. We will use a ViSi mobile device (Sotera Wireless, San Diego, CA, USA) that will provide continuous non-invasive pulseoximetry, blood pressure, skin temperature, and patient position. Respiratory function will be measured using an ExSpiron (Respiratory Motion Inc., Waltham, MA, USA) monitor which provides continuous non-invasive monitoring of tidal volume, respiratory rate, and minute ventilation. Discussion: The outcomes will reveal the effect of peri-operative IV acetaminophen use on post-operative opioid-related complications. Continuous non-invasive monitoring of vital signs is expected to accurately assess opioid-related complications after major abdominal surgery and provide reliable results correlated with opioid use. The use of novel technology in the post-operative setting permits the collection of a dense amount of data and eliminates gaps in post-operative vital sign measurements. Trial registration: ClinicalTrials.gov identifier: NCT02156154, registered on 3 June 2014. Ethics: The study protocol was approved by the Cleveland Clinic Institutional Review Board (IRB) on 28 April 2014, approval number 14-241. Unrelieved post-operative pain can lead to multiple physiological and psychological consequences which worsen outcomes. Inadequate peri-operative analgesia is associated with myocardial ischemia, impaired wound healing, delayed gastrointestinal motility, atelectasis, post-operative pneumonia, and persistent incisional pain (Desborough, 2000; Holte and Kehlet, 2000; Perkins and Kehlet, 2000; Wilmore, 2002; Brandsborg et al., 2011). Over a third of surgery patients report severe pain and half report moderate pain post-operatively (Apfelbaum et al., 2003). Estimates suggest that only one in four surgical patients in the USA receive adequate relief of acute pain. Consequently, postoperative pain remains the major pre-operative concern for patients having surgery (Phillips, 2000). Opioids are the most common treatment for post-operative pain. Opioids bind to mu receptors and affect both the peripheral and central nervous systems (Argoff, 2011; Barletta, 2012; Labianca et al., 2012). Excessive opioid use can cause several complications (Davies et al., 2009; 2012) including sedation, post-operative nausea and vomiting (PONV), urinary retention, as well as delayed gastric emptying and post-operative ileus (Panchal et al., 2007), which prolongs hospital stay, increases hospital costs (Asgeirsson et al., 2010), and decreases patient satisfaction. Since pain involves multiple mechanisms, it is ideally treated with a variety of analgesic techniques with additive or synergistic effects (Buvanendran and Kroin, 2009). Studies indicate that multimodal analgesia shortens hospitalization times, improves recovery and function, and decreases health care costs (Buvanendran and Kroin, 2009; Weinbroum, 2012). It has also been proposed to decrease opioid use and consequently the incidence of related side effects (White et al., 2007; Buvanendran and Kroin, 2009; Weinbroum, 2012). Acetaminophen use is common in multimodal analgesia as it is one of the safer options (Duggan and Scott, 2009; Jones, 2011; Smith, 2011; Pasero and Stannard, 2012; Lachiewicz, 2013) and has opioid-sparing properties (Elia et al., 2005; Remy et al., 2005; Apfel et al., 2013); however, there are no large randomized trials evaluating whether this opioid-sparing quality actually reduces complications as expected (Smith, 2011). The use of acetaminophen in peri-operative settings is relatively new but is becoming more common now that an intravenous formulation is available. One barrier to the use of intravenous acetaminophen in the peri-operative period is that it is relatively expensive compared to other non-steroidal anti-inflammatory drugs. However, the complications associated with increased opioid usage, including respiratory depression, are extremely costly. The costs of using intravenous acetaminophen for preventing opioid related side effects and the costs of treating the associated complications have not been addressed properly. We thus propose to evaluate the opioid-sparing effect of intravenous acetaminophen and, more importantly, the reduction in opioid-related complications. Specifically, we propose to test the primary hypothesis that total duration of hypoxia (defined as time with saturation of peripheral oxygen (SpO2 ) < 90%) is less in patients given intravenous acetaminophen than placebo. Our secondary hypotheses are that intravenous acetaminophen: 1) decreases post-operative opioid consumption; 2) decreases post-operative pain; 3) decreases nausea and vomiting; 4) decreases sedation; 5) improves activity; and 6) reduces fatigue. The impact of post-operative opioid related complications is not only important from a clinical perspective but also from an economic standpoint. The additional cost attributable to opioid side effects has not been well defined and usually depends on estimates rather than solid data. Our study will provide data to support a full cost-benefit analysis so the financial benefits of acetaminophen can be concretely evaluated. The study will take place at an academic center in the United States. Using a randomized design and blinded assessments, our goal is to determine the effect of intravenous acetaminophen (vs. placebo) infusion on a variety of important opioid-related complications and outcomes in post-operative patients. The proposed research will have the following aims, all of which will be assessed over 48 hours or the duration of hospitalization if shorter. To assess whether intravenous acetaminophen decreases post-operative opioid-related respiratory depression. We hypothesize that the total duration of hypoxia is less in patients given intravenous acetaminophen rather than placebo. We have defined the duration of hypoxia as total time of SpO2 < 90%. We will evaluate the role of intravenous acetaminophen on post-operative opioid consumption, post-operative pain, nausea & vomiting, sedation level, activity after surgery, cost-effectiveness, and post-operative opioid-related respiratory depression. Investigators at each center will screen for eligible patients. To ensure the blinding process, randomization of the drug will be handled by the study pharmacists. Randomization will be 1:1 and initiated at the induction of anesthesia by the pharmacy and will thus be concealed from the investigators. It will be stratified based on chronic opioid use which we have defined as opioid use for more than 30 consecutive days within the 3 months prior to surgery. All patients who are eligible to participate will be documented in a screening log. In order to participate in the study the patient must be able to give written informed consent, be between 18-85 years old, be American Society of Anesthesiologists (ASA) status 1-3, be scheduled for elective open or laparoscopic abdominal surgery, have an anticipated hospitalization of at least two nights, expected to require parenteral opioids for at least 48 hours for post-operative pain, and be able to use a patient-controlled analgesia (PCA) system. Exclusion criteria include hepatic disease (twice the normal level of liver enzymes), kidney disease (twice the normal level of serum creatinine), administration of epidural analgesia or regional blocks, acetaminophen sensitivity or allergy, female patients who are pregnant or breastfeeding, and patients taking warfarin. Patients will be free to withdraw from the study at any time. Patients may also be removed from the study for adverse events or if deemed necessary for safety concerns. This study will be a randomized, double-blind, placebo-controlled trial of intravenous acetaminophen in adults having elective major abdominal surgery. Eligible patients will be assessed for baseline characteristics then randomly assigned to intravenous acetaminophen or placebo for 48 hours post-operatively. Randomization (1:1) is generated by a computer algorithm (SAS software, SAS Institute Inc.) and stratified based on chronic opioid use. Chronic opioid use will be defined as opioid use for more than 30 consecutive days, at a daily dose of 15 mg or more of morphine or equivalent, within the 3 months before surgery. The treatment groups are intravenous acetaminophen and normal saline placebo. The randomization key (computer-generated, SAS software) is loaded onto a secure database (Research Electronic Data Capture, REDCap) and none of the study personnel will have access to it. The Pharmacy personnel performing the randomization by patient will have access to the allocation of that specific patient. All study investigators involved in delivering medication, interpreting device output, or administering questionnaires would be blinded to group allocation. After receiving consent and confirming with the anesthesia and surgical teams, the first dose of study drug (acetaminophen vs. placebo) will be brought to the operating room and administered intravenously as soon as convenient after induction of anesthesia. Anesthetic management will follow the pre-established clinical and institutional guidelines. The investigational drug in this study is intravenous acetaminophen (Offirmev® , Mallinckrodt Pharmaceuticals) 1 g per dose and the placebo control is 0.9% sodium chloride prepared in equal volume and infused at the same rate (over 15 minutes). The acetaminophen/placebo intravenous infusion will be repeated every 6 hours for the earlier of 48 post-operative hours or hospital discharge. Intra-operative opioids and benzodiazepines will be left to the discretion of the anesthesia team. However, fentanyl will be recommended for intra-operative analgesia, and hydromorphone for post-operative analgesia. Once in the post-anesthesia care unit (PACU), patients will be given intravenous PRN (pro re nata [as needed]) boluses of hydromorphone or fentanyl as necessary. Patients will be given either hydromorphone or fentanyl PCA as is standard with clinical settings with the option of fentanyl or hydromorphone for breakthrough pain. Patients will be titrated to comfort which we have defined as a pain score < 4 in the PACU and ward using allowed opioids. Patients will be continuously monitored and their peripheral oxygen saturation and non-invasive blood pressure recorded after arriving in the PACU with a ViSi mobile wireless monitor (Sotera Wireless, San Diego, CA, USA). An ExSpiron respiratory volume monitor (Respiratory Motion Inc., Waltham, MA, USA) will be used continuously for the study period and information will be recorded on the monitor which will be attached to the patient IV pole. Clinicians and nurses will be blinded to monitoring and will be required to perform their standard care management after surgery. Patients will be allowed to receive prophylactic anti-emetics intra-operatively based on risk assessment for nausea and vomiting (first choice Ondansetron). Post-operatively, anti-emetics will be used for symptomatic treatment; again Ondansetron will be the recommended first choice. The primary objective of this trial is to investigate whether the administration of IV acetaminophen starting at the beginning of the surgical procedure and continuing for 48 hours post-operatively will result in patients with shorter duration of hypoxia - as we have defined SpO2 < 90%. This analysis supposes that the administration of acetaminophen will reduce opioid usage and thus opioid-related side effects such as respiratory depression. Once the first dose is administered in the operating room, the remaining doses are spaced out with the patient receiving another dose every 6 hours. Total opioid consumption, in morphine equivalents, will be the major measure of opioid use. However, we will also record the number of times fentanyl is given for breakthrough pain. 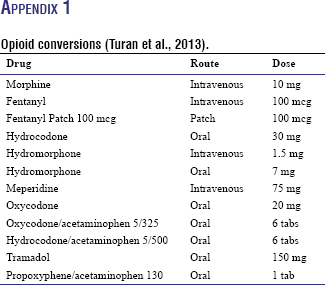 The total amount of opioids used is converted to IV morphine equivalents for analysis ( Appendix 1 ) (Turan et al., 2013). Hypothesis: Total opioid consumption is reduced by intravenous acetaminophen infusion. Our major outcome for pain will be time-weighted pain scores from discharge from the PACU until 48 hours after the end of surgery. PACU pain scores will also be compared separately. The clinical routine is to record pain scores (numerical score on a 0 to 10 scale) every 15 minutes in the post anesthesia care unit and every 4 hours on the ward, and we are including all available pain scores. Hypothesis: Intravenous acetaminophen decreases time-weighted post-operative pain scores. Our major outcome for PONV will be the cumulative incidence of nausea and vomiting outcome during the initial 48 post-operative hours. However, we will also consider the number anti-emetic rescue treatments. Hypothesis: The incidence of PONV is reduced in patients given intravenous acetaminophen. Our major outcome for sedation will be severity of sedation, as determined by the Richmond Agitation Sedation Scale (RASS) (Sessler et al., 2002) or Pasero Opioid-Induced Sedation Scale (POSS) (Pasero, 2009), during the initial 48 post-operative hours. Sedation will be determined and recorded by ward nurses per clinical routine. Hypothesis: The incidence of post-operative sedation is reduced in patients given intravenous acetaminophen. Our major measure of activity will be the time spend while sitting or upright, as determined by the ViSi mobile monitoring system, during the initial 48 post-operative hours. Hypothesis: Intravenous acetaminophen increases the time spent sitting and upright rather than lying down. Our major measure of fatigue will be a 10-point score determined on the first post-operative morning subjectively by the patient. Hypothesis: Post-operative fatigue scores are reduced in patients given intravenous acetaminophen. A cost-benefit analysis will be conducted to determine the optimal strategy of IV acetaminophen compared to placebo. The analysis will compare the costs of the intervention compared to the monetary value of the benefits. The benefits will include opioid medication reduction, length of stay reduction, nursing time reduction, hypoxia reduction, PONV reduction, and any health care resource utilization reduction attributable to reduced opioid use in the 3 months post-surgery. Hypothesis: Intravenous acetaminophen reduces total cost of care from the societal perspective by decreasing opioid-related complications and hospital length-of-stay. Continuous ExSpiron impedance data collection will occur during PACU and post-operative study period. Our major outcomes will be the tidal volume, minute volume and respiratory rate. Hypothesis: Intravenous acetaminophen reduces respiratory depression (defined by decrease in tidal volume, minute ventilation and respiratory rate) compared to placebo. We will conduct a secondary analysis within the subset of patients who has their bispectral index (BIS) values measured. We will compare the two randomized groups on total amount of anesthetic gas (MAC-hours) receive from induction to extubation, using multivariable linear regression adjusting for the time-weighted average BIS value and any imbalanced baseline variables within the subset. Intra-operative BIS values and amount of anesthetic gas will be obtained from the Cleveland Clinic Anesthesia Record Keeping System (ARKS). Hypothesis: Intravenous acetaminophen reduces MAC requirements when given intra-operatively. A timeline for participantsstudy is shown in [Table 1] and a flowchart is shown in [Figure 1]. Eligible patients scheduled for surgery will meet with a member of the Anesthesia team during their pre-operative visit. During this time the patient can elect to consent to be in the study and they will be notified of study details. Note: OR: Operating room; PACU: post-anesthesia care unit (recovery room); ViSi mobile: Sotera Wireless, San Diego, CA, USA; ExSpiron: Respiratory Motion Inc., Waltham, MA, USA; General ward: any unit the patient is admitted to after PACU. On the day of surgery, the research team will meet with the patient's anesthesiologist and certified registered nurse anesthetist to discuss the study and get their approval to move forward with the study protocol. The study-related process will then be confirmed with the patient who will be given the opportunity to ask questions related to participation. In the pre-operative area, baseline questionnaires will be conducted and pharmacy will be informed to randomize the patient and prepare the first dose of study drug. This dose will be administered at the time of induction. Upon completion of the surgical procedure,the study monitors will be attached to the patient in the PACU. Further study drug doses will be administered by the patient's nurse according to schedule (every 6 hours). Study-related outcomes (nausea, vomiting, itching, rescue medications or oxygen administration, fatigue, bowel movements) will be monitored for during the first post-operative 48 hours. At the conclusion of 48 hours of monitoring (or at patient discharge if it occurs sooner), the study monitors will be disconnected and the patient assessed for quality of recovery, satisfaction with pain management, as well as comfort while wearing the monitoring devices. A subset of these questions will also be asked during a phone interview with the patient at around 90 days post-operatively. Upon completion of these questions the patient will be thanked for their participation and they will have completed the study. All members of the study team remain blinded throughout the patient's participation in the study. All analyses will be based, as far as possible, on the intention-to-treat principle and performed by a professional statistician. The randomized groups will first be compared for balance on all potentially confounding baseline variables using standard descriptive statistics. Any imbalanced factors will be used for adjustment in all analyses comparing randomized groups on outcome. To evaluate our primary hypothesis, we will compare patients randomized to acetaminophen with those randomized to placebo on the total duration of hypoxia (defined as time spent with SpO2 < 90%).Various graphical and tabular summaries will be undertaken to characterize the hypoxic events in the two study populations (e.g., reporting incidence of any hypoxic event, summaries of timing and duration of hypoxic events relative to surgery, etc.). All analyses will be performed using R statistical software for 64-bit Microsoft Windows (The R Foundation for Statistical Computing, Vienna, Austria). The impact of post-operative opioid related complications is significant from not only a clinical standpoint but from an economic standpoint. The additional cost attributable to opioid side effects has not been well defined and usually depends on estimations rather than solid data. Our study will provide a cost-benefit analysis where the costs and benefits in monetary terms of the outcomes of multiple benefits can be compared. A cost-benefit analysis will be conducted by a professional health economist to determine the optimal strategy for economic outcomes related to IV acetaminophen and surgery. A cost benefit analysis is based on welfare economics and allows us to determine whether the outcome/benefit is worth achieving given the opportunity cost to society of all the resources consumed to achieve this outcome (Drummond and Drummond, 2005). In cost benefit analysis, all costs and benefits are measured in monetary terms. For benefits that cannot be directly measured monetarily, they are valued using a human capital, revealed preferences, or stated willingness to pay (WTP) method (Gray, 2011). By using uniform unit of benefit, multiple benefits can be included the analysis as compared to a cost-effectiveness analysis where only one unit of effect or benefit can be compared. In a cost-benefit analysis, the incremental difference in costs and benefits between interventions being evaluated determines the optimal strategy of choice. A transparent, easy to follow cost-benefit summary will be produced to aid persons in decision making positions. The summary will include the costs and benefits of each intervention, the incremental costs and benefits between the interventions, the cost benefit ratio of the interventions, and the incremental cost benefit ratio between the interventions. The uncertainty around the results will also be summarized to show that the optimal strategy is the choice strategy in 'what' percentage of time and for 'what' variable values. VISION (Vascular Events In Noncardiac Surgery Patients Cohort Evaluation) is a large prospective observational cohort study with the primary aim of evaluating major vascular events in patients undergoing non-cardiac surgery (Botto et al., 2014). We analyzed VISION preliminary data on post-operative SpO2 from the all 833 patients who had > 12 hours continuous monitoring with < 20% missing data ([Table 2]). Each patient's SpO2 -versus-time data was first smoothed using kernel regression in order to remove excess variability (see [Figure 2] for examples). Total duration of hypoxia was then computed for each patient according to their smoothed SpO2 -versus-time profiles. 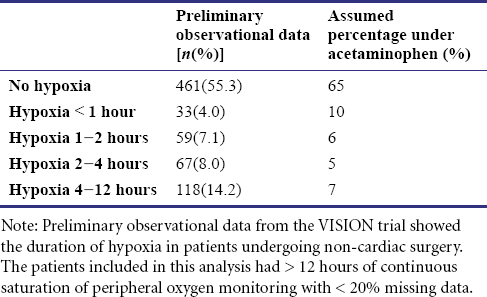 The distribution of total duration of hypoxia is summarized in [Table 2] under "Preliminary Observational Data". Figure 2: SpO2-versus-time data for patients analyzed from the VISION data (Botto et al., 2014). Note: Time series of SpO2 (green lines) for a stratified random sample of patients (i.e., two from each hypoxia classes: no hypoxia, hypoxia < 1 hour, hypoxia 1-2 hours, hypoxia 2-4 hours, hypoxia 4-12 hours, and hypoxia >12 hours). Curves representing kernel smooth estimates of each time series – by which the duration of hypoxia outcomes are defined – are overlaid (black lines). SpO2: Saturation of peripheral oxygen. For sample size planning purposes, it suffices to use power calculations for the two-sample Wilcoxon rank sum test (i.e., the planned test in the absence of imbalanced potential confounding factors). Assuming that acetaminophen reduces hypoxia risk such that the distribution of total duration of hypoxia is that given in the right column of [Table 2], a minimum of 528 patients would be required for the Wilcoxon test to have 90% power to identify a significant difference at the 0.05 level. Thus, without adjusting for interim analyses, we would enroll 528 patients in our study. Three interim analyses and one final analysis will be conducted. This allows for the possibility of stopping the trial early for efficacy or for futility (should the results indicate either outcome), at the potential expense of increasing the maximum possible study sample size (i.e., that which would be used if the trial is not stopped early). Stopping boundaries are formally defined according to respective type I (false positive) and type II (false negative) error spending rates. As mentioned above, the total type I error rate for the primary hypothesis will be controlled over the entire study period at 5%. The type II error rate for the entire study will be controlled at 10%, corresponding to 90% power. We used gamma error spending functions with rate parameters of -4 for type I error and -2 for type II error ( [Figure 3]). 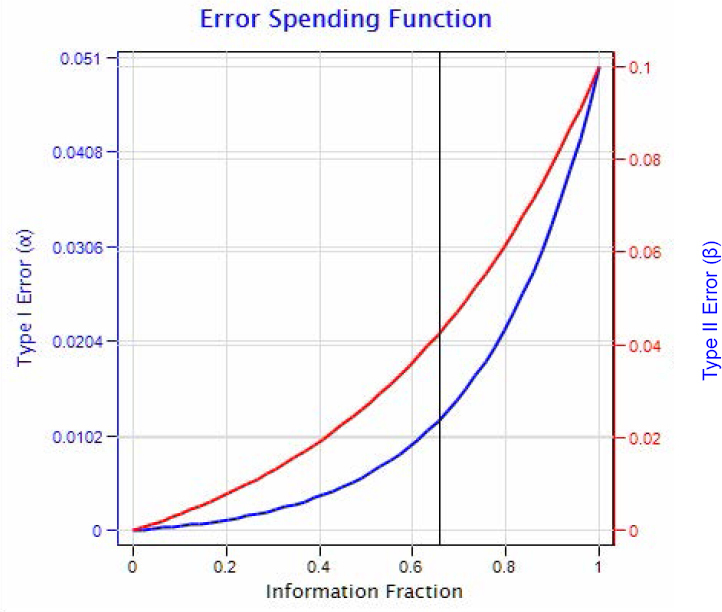 Figure 3: Type I (alpha) and Type II (beta) error spending functions over the accrued information fraction, i.e., the proportion of the maximum total sample size accrued. Interim analyses will be conducted at equally spaced intervals: 25%, 50%, 75%, and 100% of maximum planned sample size, respectively. The critical P-values of our Wilcoxon rank sum test at each of these four analyses (defined by the curves in [Figure 3]) will be P < 0.0016, P < 0.0048, P < 0.0147, and P < 0.0440 for efficacy and P > 0.9572, P > 0.7186, P > 0.2389, and P > 0.0441 for futility ([Figure 4]). The cumulative probability of crossing a boundary at the 1st through 4th interim analyses, assuming that hypothesized treatment effect reflects the true population difference, will be 0.04, 0.31, 0.80 and 1.0, respectively. 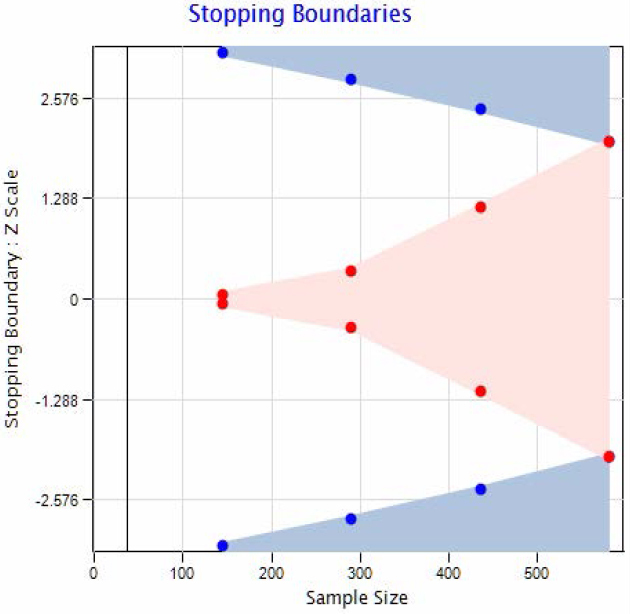 Figure 4: Type I (alpha) and Type II (beta) error boundaries over the accrued sample size. Note:Treatment effect of IV acetaminophen versus placebo plotted with the pre-determined boundaries for efficacy, harm, and futility for hypoxia. The vertical axis is the standardized effect size (Z), defined as the difference in group proportions divided by the standard error of the difference. Z = 0 indicates no treatment effect, while Z > 0 indicates that IV acetaminophen has more hypoxia than placebo, and Z < 0 indicates that IV acetaminophen has a lower incidence of hypoxia than placebo. The horizontal axis indicates the number of planned (N = 580) patient enrollment. At each of the interim analyses (25%, 50%, 75%, and 100% of the total sample size), crossing a blue dot (into the blue shaded regions) indicates efficacy while crossing a red dot (into the red shaded region) indicates futility. Adjusting for interim analyses, the maximum possible sample size will be N = 580 patients, corresponding to interim analyses at N =145, N = 290, N = 435 and 580, respectively, as needed. Though boundaries may be crossed, imbalanced covariables may yet remain (and thus the need to use the multivariable Poisson/negative binomial regression model to account for chance imbalances). Stopping criteria under these count regression models are difficult to define, as two effects result from such analyses (the odds ratio for zero versus positive hypoxia outcome as well as the ratio of means among patients with positive outcomes). We will report balance on covariables and results from the count regression models at each stage of the study to the Data Safety Monitoring Board ([Figure 4]). Multimodal analgesia has been advocated as a suitable option to treat post-operative pain more efficiently (Buvanendran and Kroin, 2009). It has been suggested to decrease post-operative opioid consumption while decreasing cost and opioid-related adverse events (White et al., 2007; Buvanendran and Kroin, 2009; Weinbroum, 2012). However, it remains to be confirmed in a large, randomized trial that opioid reduction is indeed warranted and significantly reduces post-operative complications related to excessive opioid use. The use of continuous non-invasive vital sign monitoring in the post-operative period is relatively recent. The technology is developing alongside with wearable devices and seems to be shaping the future of in-hospital as well as ambulatory monitoring. Prior attempts from our center at capturing continuous post-operative peripheral oxygen saturation were faced with multiple difficulties, namely bulky devices and less user-friendly interfaces. Nowadays, there are multiple options for such monitors and this is expected to improve rapidly with the growing interest in the medical community. The monitors used in this trial will permit the continuous and non-invasive measurement of SpO2 , 3-lead electrocardiogram, tidal volume, respiratory rate, minute ventilation, blood pressure, skin temperature, and patient position. This will be the largest prospective trial to date employing such advanced technology in order to capture accurate outcome data. The trial is actively enrolling patients and is approaching the second interim analysis. (2012) The Joint Commission and the FDA take steps to curb adverse events related to the use and misuse of opioid drugs. ED Manag 24:112-116. Apfel CC, Turan A, Souza K, Pergolizzi J, Hornuss C (2013) Intravenous acetaminophen reduces postoperative nausea and vomiting: a systematic review and meta-analysis. Pain 154:677-689. Apfelbaum JL, Chen C, Mehta SS, Gan TJ (2003) Postoperative pain experience: results from a national survey suggest postoperative pain continues to be undermanaged. Anesth Analg 97:534-540. Argoff C (2011) Mechanisms of pain transmission and pharmacologic management. Curr Med Res Opin 27:2019-2031. Asgeirsson T, El-Badawi KI, Mahmood A, Barletta J, Luchtefeld M, Senagore AJ (2010) Postoperative ileus: it costs more than you expect. J Am Coll Surg 210:228-231. Barletta JF (2012) Clinical and economic burden of opioid use for postsurgical pain: focus on ventilatory impairment and ileus. Pharmacotherapy 32:12S-18S. Botto F, Alonso-Coello P, Chan MT, Villar JC, Xavier D, Srinathan S, Guyatt G, Cruz P, Graham M, Wang CY, Berwanger O, Pearse RM, Biccard BM, Abraham V, Malaga G, Hillis GS, Rodseth RN, Cook D, Polanczyk CA, Szczeklik W, et al. (2014) Myocardial injury after noncardiac surgery: a large, international, prospective cohort study establishing diagnostic criteria, characteristics, predictors, and 30-day outcomes. Anesthesiology 120:564-578. Brandsborg B, Dueholm M, Kehlet H, Jensen TS, Nikolajsen L (2011) Mechanosensitivity before and after hysterectomy: a prospective study on the prediction of acute and chronic postoperative pain. Br J Anaesth 107:940-947. Buvanendran A, Kroin JS (2009) Multimodal analgesia for controlling acute postoperative pain. Curr Opin Anaesthesiol 22:588-593. Davies EC, Green CF, Taylor S, Williamson PR, Mottram DR, Pirmohamed M (2009) Adverse drug reactions in hospital in-patients: a prospective analysis of 3695 patient-episodes. PLoS One 4:e4439. Desborough JP (2000) The stress response to trauma and surgery. Br J Anaesth 85:109-117. Drummond M, Drummond M (2005) Methods for the economic evaluation of health care programmes, 3 rd Edition. New York: Oxford University Press. Duggan ST, Scott LJ (2009) Intravenous paracetamol (acetaminophen). Drugs 69:101-113. Elia N, Lysakowski C, Tramer MR (2005) Does multimodal analgesia with acetaminophen, nonsteroidal antiinflammatory drugs, or selective cyclooxygenase-2 inhibitors and patient-controlled analgesia morphine offer advantages over morphine alone? Meta-analyses of randomized trials. Anesthesiology 103:1296-1304. Gray A (2011) Applied Methods of Cost-Effectiveness Analysis in Health Care. New York: Oxford University Press. Holte K, Kehlet H (2000) Postoperative ileus: a preventable event. Br J Surg 87:1480-1493. Jones VM (2011) Acetaminophen injection: a review of clinical information. J Pain Palliat Care Pharmacother 25:340-349. Labianca R, Sarzi-Puttini P, Zuccaro SM, Cherubino P, Vellucci R, Fornasari D (2012) Adverse effects associated with non-opioid and opioid treatment in patients with chronic pain. Clin Drug Investig 32 Suppl 1:53-63. Lachiewicz PF (2013) The role of intravenous acetaminophen in multimodal pain protocols for perioperative orthopedic patients. Orthopedics 36:15-19. Panchal SJ, Muller-Schwefe P, Wurzelmann JI (2007) Opioid-induced bowel dysfunction: prevalence, pathophysiology and burden. Int J Clin Pract 61:1181-1187. Pasero C (2009) Assessment of sedation during opioid administration for pain management. J Perianesth Nurs 24:186-190. Pasero C, Stannard D (2012) The role of intravenous acetaminophen in acute pain management: a case-illustrated review. Pain Manag Nurs 13:107-124. Perkins FM, Kehlet H (2000) Chronic pain as an outcome of surgery. A review of predictive factors. Anesthesiology 93:1123-1133. Phillips DM (2000) JCAHO pain management standards are unveiled. Joint Commission on Accreditation of Healthcare Organizations. JAMA 284:428-429. Remy C, Marret E, Bonnet F (2005) Effects of acetaminophen on morphine side-effects and consumption after major surgery: meta-analysis of randomized controlled trials. Br J Anaesth 94:505-513. Sessler CN, Gosnell MS, Grap MJ, Brophy GM, O′Neal PV, Keane KA, Tesoro EP, Elswick RK (2002) The Richmond Agitation-Sedation Scale: validity and reliability in adult intensive care unit patients. Am J Respir Crit Care Med 166:1338-1344. Smith HS (2011) Perioperative intravenous acetaminophen and NSAIDs. Pain Med 12:961-981. Turan A, Atim A, Dalton JE, Keeyapaj W, Chu W, Bernstein E, Fu A, Jae Ho L, Saager L, Sessler DI (2013) Pre-operative angiotensin-converting enzyme inhibitor use is not associated with increased postoperative pain and opioid use. Clin J Pain 29:1050-1056. Weinbroum AA (2012) Non-opioid IV adjuvants in the perioperative period: pharmacological and clinical aspects of ketamine and gabapentinoids. Pharmacol Res 65:411-429. White PF, Kehlet H, Neal JM, Schricker T, Carr DB, Carli F, Fast-Track Surgery Study G (2007) The role of the anesthesiologist in fast-track surgery: from multimodal analgesia to perioperative medical care. Anesth Analg 104:1380-1396. Wilmore DW (2002) From Cuthbertson to fast-track surgery: 70 years of progress in reducing stress in surgical patients. Ann Surg 236:643-648. WS designed the study and wrote the manuscript, and will conduct the clinical trial. NJ, TS, KH, CC, and AT wrote the manuscript and will conduct the clinical trial. All authors reviewed and approved the final manuscript. The authors would like to acknowledge the contributions of Jarrod Dalton, Ph.D. for his work on the statistical design and Nicole Zimmerman, M.S. for her work on data management and analysis.